Yes – iPage supports a variety of different content management systems, with the two most popular being WordPress and Joomla. 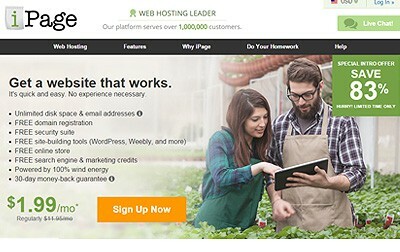 When it comes to price and value, very few other web hosts can compete with iPage among users who prefer Joomla as their content management system. Installing Joomla is a fairly easy process and iPage’s support staff can do it for you if necessary. But really, you can do it yourself automatically in less than 5 clicks with their automated installer. One of the main perks of working with both iPage and Joomla is that there is very little that needs to be known in order to effectively use the CMS. The user manager in Joomla is exceptionally easy-to-use, even for non tech savvy users. On top of making it easy-to-install and set up, iPage also goes out of their way to provide users with plenty of tutorials on using Joomla. They have video tutorials for everything from using the user manager to changing your site’s language in Joomla. On top of the informative tutorials, the iPage resource center and knowledge base features a ton of guides and helpful articles to answer any further questions that you may have. In addition, they have a very active forum where admins and experienced users can help you with any unique issues that pop up. Overall, signing up with iPage is a wise option for users that plan on using Joomla as their CMS. Recommended for you: See my review of iPage to get several tips you should know before you sign up with them.